For nearly 500 years (1420-1911), twenty-four emperors of the Ming and Qing Dynasties ruled China from inside the Forbidden City. It has lavishly decorated ceremonial halls and royal palaces that were built to impress the eye. The emperors who lived within the massive walls seldom ventured outside. It was rampant. So were internal political power struggles. The complex gained its ominous sounding sobriquet because entry was once strictly prohibited without royal authorization. A visit without that sanction would automatically cost your life. 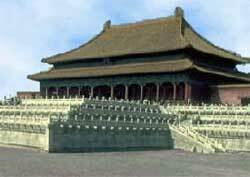 The Forbidden City is in much better condition today than it was on my first visit several decades ago. The government has been making a major effort in renovating the palace, bringing it back to its former architectural grandeur.